Peal essence mask! It's suited for all skin types and for all seasons! 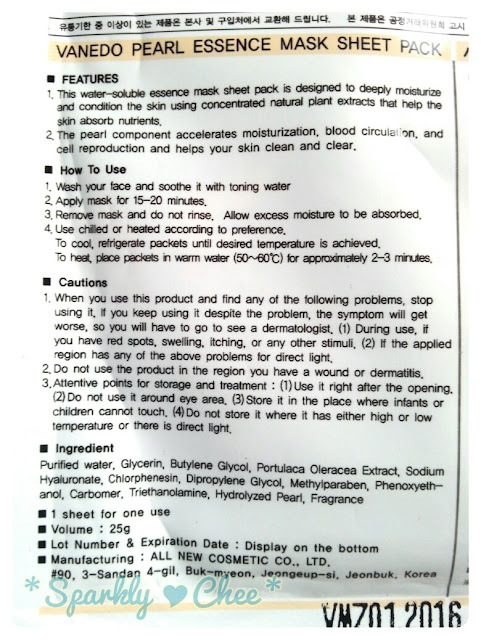 Lot's of info on the back! 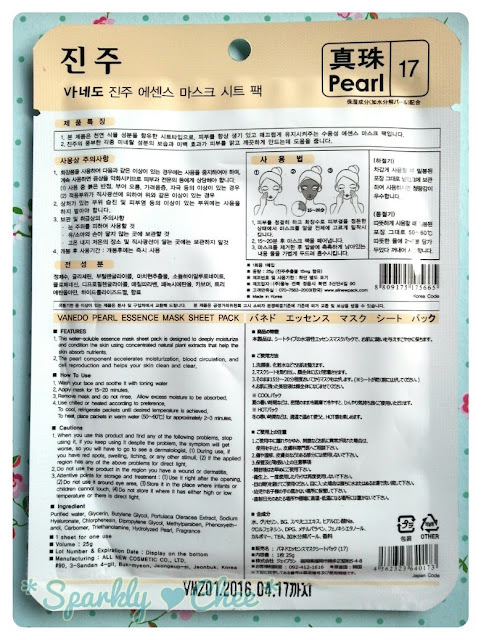 Also it's nice to see alcohol is not an ingredient in this mask unlike in the Holika Holika mask I reviewed last time. The mask was so wet when I toke it out, practically dripping! You can see a pool of serum on my palm! It was also very drippy with serum, even dripped on the floor while to toke it out. Good thing it wasn't sticky, but I really dislike excessive serum on sheet masks, it just makes everything messy, and usually ends up as waste. Convergence wise, I'll just assume it's pore minimizing. I didn't really see a difference in my pore size to be honest. If I'm wrong on the definition please don't hesitate to let me know! Also, another plus was that this mask was not sticky! 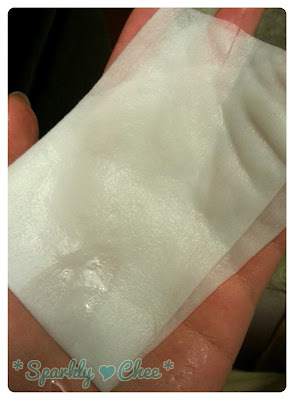 If you have read my other reviews you'll know how much I dislike stickiness on my face. xD Even though this mask left a lot of serum behind, it got fully absorbed after a few minutes. The scent is a very light sweet floral, couldn't even detect it after some time. Have you tried any Vanedo or Beauty Friends masks? Thanks so much fore reading! Oh really nice mask! 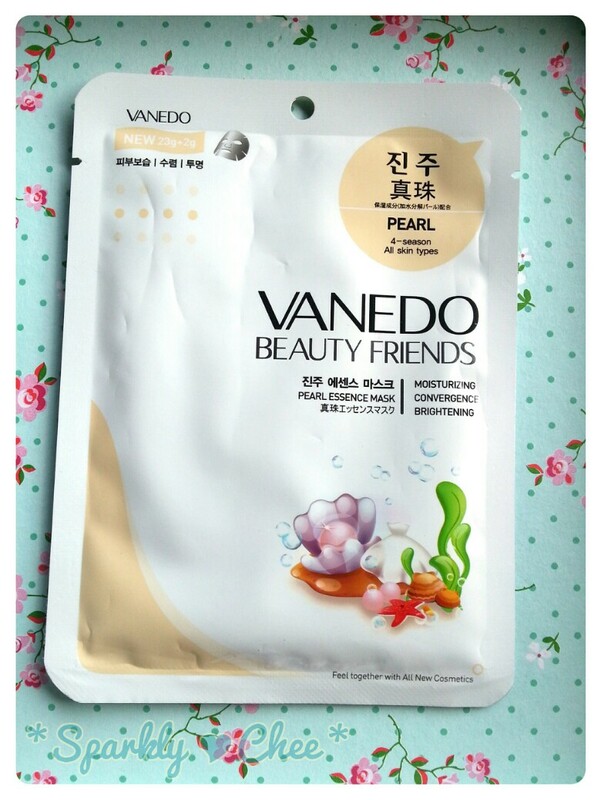 I never tried any mask from Vanedo. And Idk~ Im going to take my chances and guess that convergence means tightening?? Which means it can potentially mean pore minimizing or it can mean somewhat firmer and tighter feeling skin. haha! At first I thought they didn't fully cut the hole properly, but I guess it turns out it's just supposed to be like that. :P Yes! It's even too big for me! This is my first time trying a Vanedo mask too! ^^ Thanks for reading ! Thanks for reading as always Aria! Yeah haha, because there's a lot of serum left in the packet too when you take it out, so it would be a waste to just leave it there xD. You can store it in some travel-sized containers :D.
It is xD. 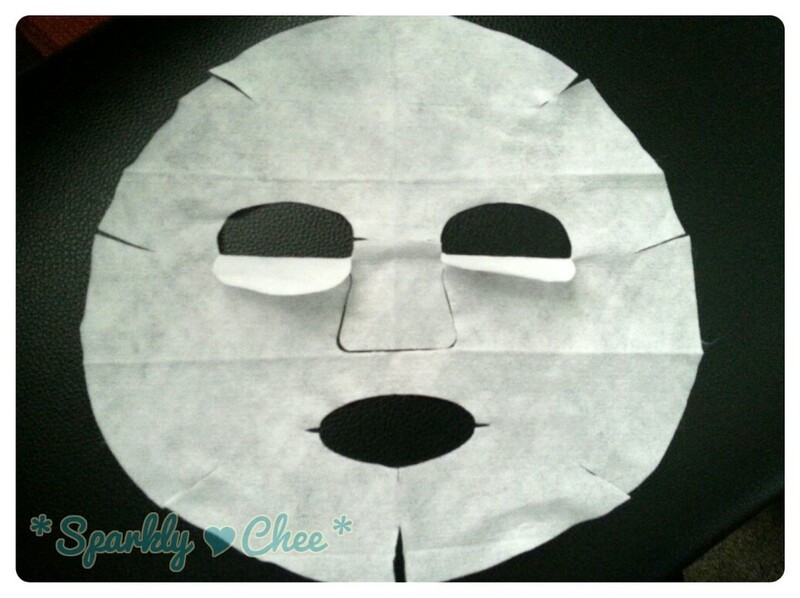 Some people use the mask twice too, although idk whether that's good or bad OTL. it's the first time I heard about this brand.. I didn't know this brand :D But as you say that it is uncomfortable I think I will skip trying this :D Thanks for the review! Ya it is! I looked it up online, and it gave me calculus and mathematical results haha! I need need to try the snail type, better be good! Thanks for reading Schnee! Never heard of this brand but the amount of serum reminds me of My Beauty Diary masks.